MUDGUARDS, CLEAR WHITE, CARPETED FLOOR MAT, CARGO NET, BLACK, CLOTH SEAT TRIM -inc: Woven and tricot, Wheels: 16" Alloy, Variable Intermittent Wipers, Urethane Gear Shift Knob, Trip Computer, Transmission: 6-Speed Automatic w/Sportmatic -inc: active ECO system and drive mode select system (normal, comfort, sport), Remote Keyless Entry, Cruise Control w/Steering-Wheel Mounted Controls, Center Console Armrest, storage, Illuminated Ignition Cylinder Ring. 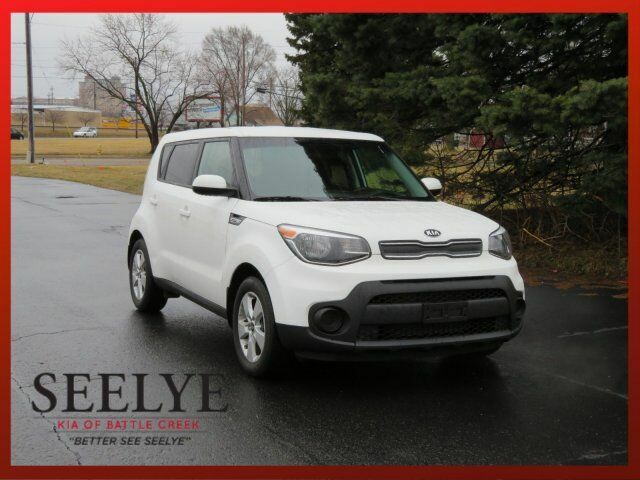 This Kia Soul has a powerful Regular Unleaded I-4 1.6 L/97 engine powering this Automatic transmission. Torsion Beam Rear Suspension w/Coil Springs, Tires: P205/60R16, Tailgate/Rear Door Lock Included w/Power Door Locks, Strut Front Suspension w/Coil Springs, Spare Tire Mobility Kit, Single Stainless Steel Exhaust, Side Impact Beams, Remote Releases -Inc: Mechanical Fuel, Rear Cupholder, Rear Child Safety Locks, Radio: AM/FM/MP3 Audio System -inc: Voice Recognition (VR) technology, SiriusXM, 6 speakers, 5.0" touch screen, USB/auxiliary input jacks, Bluetooth wireless technology and steering-wheel-mounted audio and Bluetooth controls, Radio w/Seek-Scan, Clock and Speed Compensated Volume Control, Power Rear Windows and Fixed 3rd Row Windows, Power Door Locks w/Autolock Feature, Power 1st Row Windows w/Driver 1-Touch Down, Outside Temp Gauge, Outboard Front Lap And Shoulder Safety Belts -inc: Rear Center 3 Point, Height Adjusters and Pretensioners, Manual w/Tilt Front Head Restraints and Manual Adjustable Rear Head Restraints, Manual Tilt/Telescoping Steering Column, Manual Air Conditioning.